Kalandra Jane - Millinery and Musings! : My Perfect Summer Dress - Preparation! For six months, I watched some fabric online, intending to buy it 'when I had the money' to make my perfect summer dress. 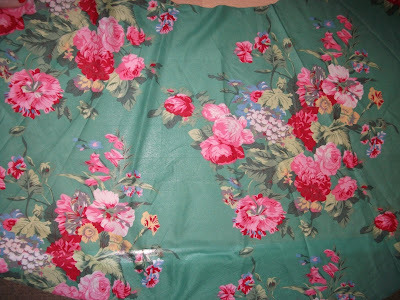 It was lime green cotton sateen with huge orange and cream rose bouquets printed all over it - my favourite colour, very retro, and very over the top, ie. perfect. I went to purchase some last week, only to find it sold out and unavailable anywhere on the web. Gutted. In reality the green is brighter, a beautiful shade of emerald. The print is marvellous, it was a bargain at £3.29 a metre, it's a lovely thin Summery cotton, and there were four metres left on the roll - exactly the amount I needed for my project! Aerospace Boyfriend said it looks like his mum's sofa fabric from the 80s, but he is clearly blind to its fabulousness and only reads this blog to ogle my outfit pictures anyway, so I'm not listening to him. The pattern I am using is based on Butterick 6582, version C, except where it has only a flared skirt I'm making mine a full circle, and I'm dropping the neckline a bit as I find the high style of the standard pattern is unflattering on me. 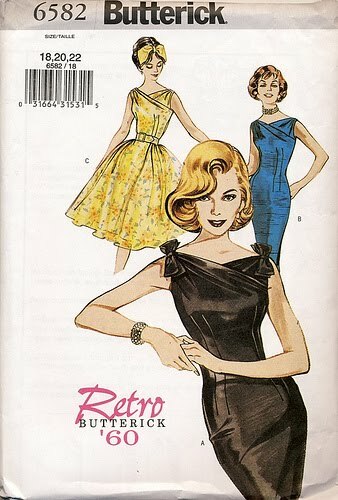 There are lots of finished versions of this pattern to be seen here at the Sew Retro Blog. I have made the pencil style three times before; once in atomic barkcloth, once from sequin-covered fabric that killed my sewing machine and sliced my armpit to ribbons, and once with a modified wrap-over sarong front, so hopefully I'm practised enough at it for this dress to come out well! I also plan to draft a pattern for a little bolero to go with it, and a matching hat too. I'm not sure of the era, maybe 30s or 50s? 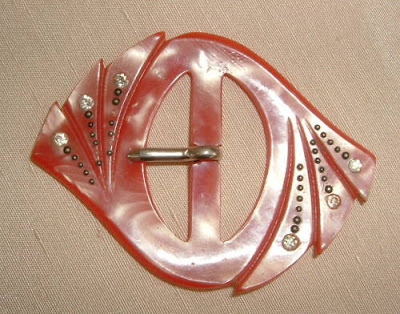 I have some of the tiny vintage cabochons in my stash to replace the missing ones too. I shall post a picture when it's done! Beautiful fabric! I have that pattern too. Love it, and the buckle. I hate it when that happens, the gnashing of teeth and the " why didn't I buy it sooner." If you lived near me I would throw myself at your mercy and beg for dressmaking lessons! that fabric is nomalicious. i'm so jealous kally, if i had the time i would learn to sew myself but i just dont :( i want pretty things!!! !